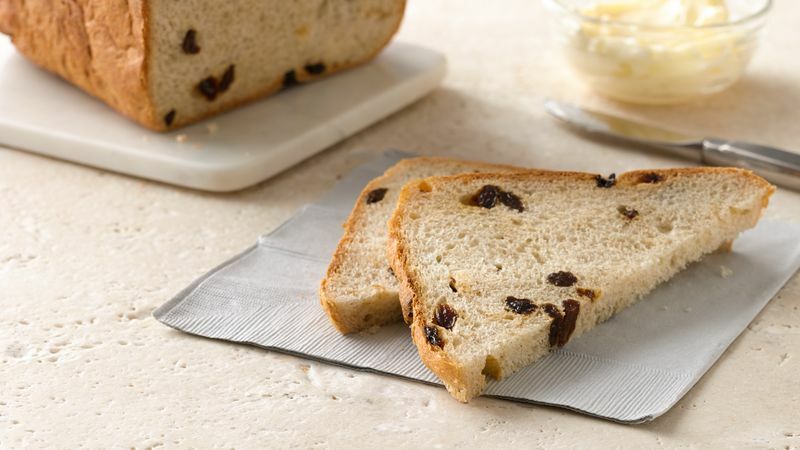 Measure carefully, placing all ingredients except raisins in bread machine pan in the order recommended by the manufacturer. Add raisins at the Raisin/Nut signal or 5 to 10 minutes before last kneading cycle ends. Select Sweet or Basic/White cycle. Use Medium or Light crust color. Remove baked bread from pan and cool on wire rack. Why is Gold Medal® Better for Bread™ flour better for bread? With more protein than all-purpose flour, bread flour produces a heartier, more breadlike loaf. Spreads with at least 65% vegetable oil can be used in place of the butter.